I'm thinking I should rename this blog - Beets, Bonbons and Baby Food! At least it would be a little more relevant to my life right now; I can't remember the last time I ate a beet and I'm certainly not experimenting with new bonbon recipes... ah, motherhood. I am, however, perfecting the technique of steaming and pureeing. I've mastered the Beaba Baby Food Maker - cooking carrots? Fill the water up to level 3. Pears? Level 2 and pour out the steaming water before pureeing. Have just one random zucchini squash and one random apple - combine and steam to make Samantha's next meal! It's been a lot of fun to introduce Samantha to new foods. And so far, it's only the green beans that cause her to fuss. Frankly, I don't blame her. This is a picture from Samantha's first Thanksgiving dinner. No turkey this year, but she enjoyed sweet potatoes, mashed potatoes, apples and cranberry sauce. So, I'm only about two months behind on the baby food update since we started feeding Samantha solid foods at 5 months old. Now at 7 months, she is up to three meals a day already! A growing girl. 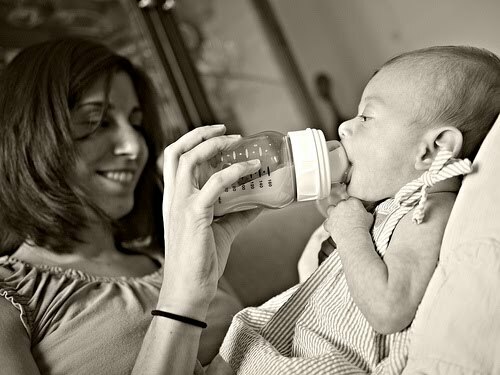 At our pediatrician's instruction, we started with rice cereal mixed with breast milk or formula. It tasted like cardboard, but we learned that any solid foods given to babies before 5 months is really just for practice. It is apparently quite a complex task to move food from the front of one's mouth to the back and then swallow it, so baby needs practice. After two weeks of mastering rice cereal, we were so eager to introduce her to "real" food. I picked up some carrots at Whole Foods and unpacked the baby food maker. In no time, I had steamed and pureed carrots that just needed some cooling time before becoming Samantha's first meal. I picked up some of these baby food storage trays, that freeze the food into ice cubes that are the perfect portion for meal time and easily defrostable. Since the introduction to carrots, which Samantha took to quite well, she has enjoyed apples, butternut squash, bananas, avocado, peas, green beens, sweet potatoes, and most recently blueberries. I'm back on the cooking scene, although still not for myself! Hello there everyone who is no longer reading this blog because it has been 11 months since my last posting. But, I have a good excuse, I swear!! Do you remember that fruity looking drink I had at the 1st food blogger happy hour? Well, it was just that. Grapefruit juice! No alcohol! I was just a few weeks pregnant! Since then, I survived morning sickness, evening sickness, little to no interest in food (and thus no desire to cook, eat out, or write about food), and a modified protein-heavy-carb-light diet due to gestational diabetes - oh, and the DELIVERY of course! But, it was all worth it because 9 months later, my husband and I were rewarded with the birth of a beautiful daughter, Samantha, who has brought us so much joy and happiness over her now 3 1/2 months of life. I'm getting back into food - slowly - although I have hard time finding time to cook. I'm getting back into the food scene - again slowly - as I start to discover all of the new restaurants and food trucks (so many food trucks!) that have opened since my sudden disappearance from said food scene. I've lived in this city for 10 years (almost to the day, in fact). I've gone through multiple and varied phases of "hobbies" that have introduced me to many different people in the city - volunteering (social and political), painting, drawing, and photography classes, art and museum meet-ups, neighborhood planning groups etc. and I can now say that I have never had as much fun at an organized meeting of like-minded people as I did last night at the DC Food Blogger Happy Hour. Many thanks to Mary from Arugula Files, Amelia from Gradually Greener and Jenna from Modern Domestic for organizing! (Click on their links to see photos from the event). Cathy from We Love DC also did a great write-up on their site and I say this for many more reasons beside the fact that she mentions Beets and Bonbons. We all inhabit a small, little, infinitesimal actually, space on (in?) the Internet, writing about what we think is important and hoping that someone out there does too. Last night's happy hour was humbling (wait, you remember that post of mine on Rick Bayless? I read your blog, too! All the time! ), satisfying (so not every meal you make is blog worthy?) and surprising (over 60 people showed up. Who know there were so many of us!). It was a chance to share funny stories and blogging tips - it seems the jury is still out on ad space but overwhelmingly likes Wordpress (good news for the Wordpress guy that was there). And it was great to finally meet the faces behind the twitter feeds and blogs I follow. And in the coming days, I have MANY more to add to the blog roll on the right, so stay tuned. You don't want to miss out on these! The blogs I read regularly became all the more interesting having met the creative minds behind them, and I learned about many that I should have been reading since day one. The best news is that it looks like the happy hours will continue on a regular basis. I look forward to meeting everyone that I didn't have to chance to say hi to last night. See you soon! First things first: I'm not a baker. Second admission: I've never baked a bread that has turned out perfectly (most are inedible). Third: this one also had its flaws, but for someone more experienced in making breads, I'm certain you could figure this one out. All that being said, I decided to give it another try. From this month's Food & Wine magazine, I was particularly drawn to to the Yogurt-Zucchini Bread with Walnuts recipe. It looked easy, and required minimal ingredients and equipment. All you have to do is mix ingredients together by hand - how hard could that be? Plus it uses Greek yogurt to add moisture without adding fat. At the last minute, I decided to add some chopped up figs from my parents' fig tree. I can't imagine that this is where things went wrong, but who knows? With baking, you have to be perfectly precise, right? The result was tasty, for sure. And even moist. But heavy. Oh so heavy. Did I over mix? Did I not measure the ingredients perfectly? Was it the figs? It may take a few more tries (and a few more trips to my parents' fig tree) to know for sure. In any event, I share the recipe with you because I think it has really good potential. And hopefully, you'll have better luck. 1. preheat oven to 325 degrees F. Butter and flour 9 x 4 1/2 inch metal loaf pan. Toast walnut halves until they are fragrant, coarsely chop and freeze for 5 minutes to cool. 2. In a large bowl, whisk flour with baking powder, baking soda and salt. In medium bowl, mix the sugar with the eggs, vegetable oil and yogurt. Add the wet ingredients to the dry ingredients along with the grated zucchini, chopped figs and toasted walnuts and stir until batter is evenly moistened. Scrape the batter into the prepared pan and bake for about 1 hour and 10 minutes, until the loaf is risen and a toothpick inserted into the center comes out clean. Let the loaf cool on a rack for 30 minutes before serving. Every summer since we got engaged on the beach, my husband and I find at least a week to escape to his parents' beach house in Montauk, NY. What was once a sleepy fishing town has become a haven for summer weekenders from "the city". It is, in fact, starting to become so popular that I'm afraid it is in danger of becoming an extension of the Hamptons. (That's a note to you, New York Times, and you, Food & Wine Magazine - stop writing about Montauk. It is our little secret! Of course, aren't I now guilty of the same thing?). To me Montauk is synonymous with lazy days and late meals and curling up in bed satiated by both the day's sun and the night's dinner. The positive aspect of becoming a potential East Hampton East, is the recognition of the quality chefs and restaurants, both new and old - Top Chef contestant Sam Talbot and his Surf Lodge, for one. The beach is no longer only for fried clams and ice cream (although any beach trip would be incomplete without having both at least once). Leading up to our annual vacation, we generally plot out our dinners. Typically, we'd like to leave a beach vacation room for some spontaneity, but the restaurants on Montauk have strict reservation policies/ recommendations: reserve one week out, two days out, reserve day of (phones open at 4:15pm) unless you are a party of 6 or more, then you can call the day before and of course, there are the handful that take no reservations at all. Some are closed Mondays, others on Wednesdays, others (because of the new-found popularity) are just about impossible to get into if you have not arrived by 7:00pm. In one case, the restaurant will stop taking names as early as 8pm if it appears the kitchen will be backed up. Kitchen at said restaurant closes at 10pm sharp. Now, why would we go through all of this rigamarole on vacation? Because the food is worth it. 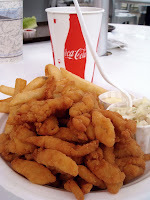 The creme de la creme of Montauk restaurants, in my opinion. This is the restaurant where you have to call at exactly 4:15pm on the day that you wish to eat there. Once you secure the coveted reservation and upon arrival, the owner will greet you and take you to your table which may be outside on the covered veranda overlooking the harbor or within the cozy interior of the restaurant. The menu highlights local, fresh fish with a few non-seafood options. Our favorites: fried oysters, tuna tempura sushi, smoked tuna spread, coconut fried shrimp and/or spareribs for an appetizer and baked stuffed lobster, paparadelle with lobster ragu, any of the fish specials (a recent horseradish encrusted halibut was to die for), and of course, Dave's Original Cioppino as an entree. 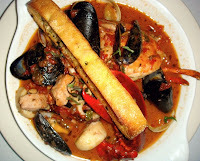 The cioppino arrives in a lovely light and savory tomato broth complete with scallops, shrimp, clams, calamari, mussels, fish, and a half lobster, plus a toasted crostini for dipping. A seafood lovers delight. And the best part? Chef David Marclay shares his recipe on the restaurant's Web site. At this point, you better hope you saved room for dessert because the Barbara (a chocolate fudge brownie sundae) and the famous Chocolate Bag (Belgian chocolate bag filled with Tahitian vanilla ice cream and strawberry compote, finished with whipped cream, raspberry and mango sauce - served with a steak knife to break the dessert apart) are must haves. 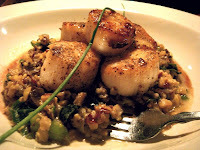 my surprise when I found seared sea scallops over risotto with black truffle essense on the menu. And is that a sushi bar off to the side? 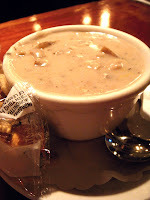 They serve both New England and Manhatten clam chowder, and true to their name, they do both with great success. The sushi is delicious and inventive and fresh off the boat. Sometimes, just sometimes, you get a little tired of seafood on a beach vacation. When this happens in Montauk, we head to East by Northeast. Specifically for the Long Island Duck. East by Northeast, owned by the same folks as Harvest (another great Montauk find), takes a wordly fusion approach to food - blending flavors from the far east with down-home American cooking. Take the Peking duck tacos for example - one of our favorite appetizers. Juicy shredded duck topped with hoisen barbeque sauce and fresh guacamole held together by a wonton taco shell. And if that's not enough, one of us usually orders the Long Island Crescent duck breast, served with a pinot noir cassis glace and a vegetable spring roll. Also good are any of their steaks. 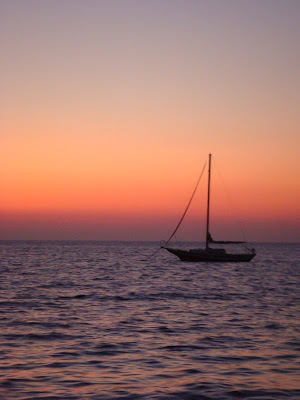 If you can get a reservation early enough, East by Northeast has a beautiful view of the summer sunset over Fort Pond. salad, and seaweed salad for snacking. Wok and Roll is the resident Chinese food restaurant. Chinese food? At the beach, you say? Well, Wok and Roll will take your fresh caught fish and cook it up for you. I'm not kidding when I say that you haven't lived until you've had General Tso's striped bass. Yum! I'm just back from vacation with a boatload of food pictures to go through and blog entry ideas to sort out, but on my return I was thrilled to find out that a food blogger happy hour was in the works, thanks to the great minds at The Arugula Files, Gradually Greener and Modern Domestic. We write, comment, and tweet and now here's our chance to put names and faces to the recipes and recommendations we love to share. I'll be there. Will you? And I promise to see Julie and Julia by then! Welcome to Beets and Bonbons - a blog dedicated to celebrating all things food related. Here you will find regular posts on what's cooking in my kitchen, along with food news and observations (Washington, DC related and otherwise), recipes, cooking tips and techniques. Browse the recipe index below to find just what you are looking for, or by contributor to see what everyone else is cooking. Think of this site as a virtual recipe box to flip through when you're seeking something new to make, or the perfect dish for that special occasion. Enjoy!